Beginning of "The Lament of the Old Woman of Beare"
We're halfway through winter. 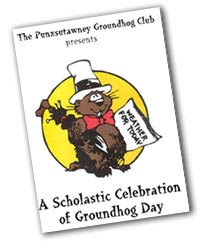 American children will hear tales of Punxsutawney Phil today, wrapped in cozy classrooms, bellies full of lunch made by strangers. An Cailleach Bhearra wandered around back in the 10th century in western Ireland, looking for firewood yesterday. If the day was bright and sunny, beware--she had gathered plenty of wood and was set for many cold days ahead. If the day was gray, she didn't bother, and she will make the days warm up again. Sound familiar? The next three months will see the days grow longer faster than they do at any other time of year. We gain over two more minutes a day of sun now at our latitude. We'll gain a quarter hour of sunlight a week, over an hour's worth in a month. So when children gather around the internet this morning to see Phil's forecast, brush up on your astronomy and spend a moment or two asking the students to watch what happens to daylight in the next few weeks. I'm going to look for crocuses today. themselves founded on earlier pagan myths developed back when paying attention to the natural world might keep you alive one more winter. This was originally posted in 2009. Candlemas! The difference in length of day and sun angle is noticeable. The midday shadows are shrinking. Candlemas! Merry Imbolc! Happy Groundhog Day! Every year I am astonished that the sun disappears, and every year, I am astonished that it returns. I am extremely attached to our sun.